This spiral bound edition brings together many of the church's most recent songs and hymns in one volume. Includes a free words CD-Rom and audio sampler. Please note, you do not require the Update if you purchase the volume 3 Music Edition. Songs of Fellowship Update - Music with CD Rom by Various was published by Kingsway in January 2001 and is our 5369th best seller. 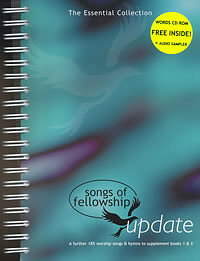 The ISBN for Songs of Fellowship Update - Music with CD Rom is 9780854769773. Be the first to review Songs of Fellowship Update - Music with CD Rom! Got a question? No problem! Just click here to ask us about Songs of Fellowship Update - Music with CD Rom. What does the CD Rom that comes with "Songs of Fellowship Update" contain? A:The CD Rom that comes with "Songs of Fellowship Update" contains the words to the music and an audio sampler.